What is a Rhode Island Promissory Note? Rhode Island Promissory Note: What Is It? A Rhode Island promissory note is a written contract between a lender and a borrower regarding a loan that was made. A promissory note may be secured or unsecured. 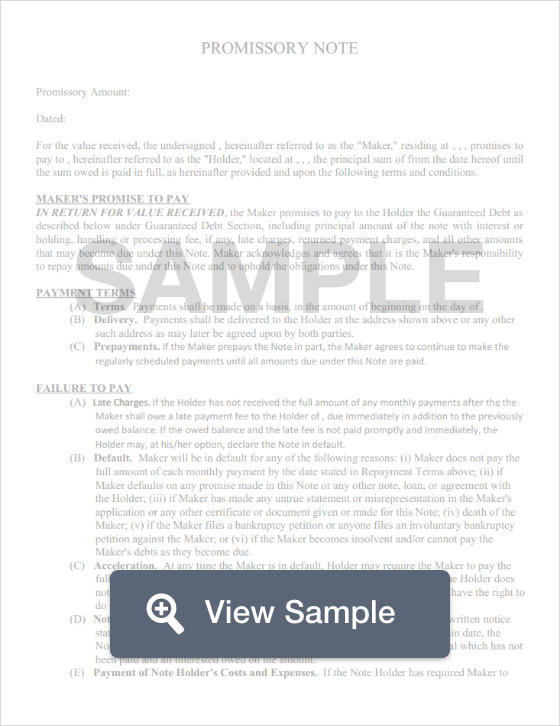 When a promissory note is secured, the lender has the legal right to take a specific piece of collateral that was mentioned in the promissory note if the borrower does not pay as promised or if they break the terms of the agreement in some other way to repay all or some of the outstanding balance. When a Rhode Island promissory note is unsecured, there is no collateral that may be collected. What Is the Maximum Amount of Interest That May Be Charged in Rhode Island? For Rhode Island promissory notes, the maximum amount of interest that may be charged is 21% or an annual rate that is equal to nine percentage points plus the index of the domestic prime rate published in Money Rates, found in The Wall Street Journal, on the last business day of the month. The date the Rhode Island promissory note is created. This date is placed below the title and is written as month, day, and year. This date, as well as the date that the document is signed, plays an important role because it helps validate the fact that the loan was received and that there was a promise to repay. The dates also help establish legal deadlines related to certain activities like filing a lawsuit or collections. Identification of each party and the role they have within the agreement. It is extremely important to use the full legal name for each party and their role. This should be done for the lender, the borrower, and any co-signer. For example, Treetop Personal Loans, Ltd., Lender. The mailing address for each party. Remember to include the city and town, state, and zip code for each party’s mailing address. If the promissory note is secured, list the physical address for the borrower and the co-signer (if there is one) if that address is different from the listed mailing address(es). For lenders, there may be a mailing address for general contact as well as a mailing address specifically for payments. The primary contact address should be listed here. The payment address should be listed in the section that addresses how the loan will be repaid. The amount provided as a loan. This is known as the principal balance. Interest should not be mentioned here because it is addressed in its own section. Before the promissory note is executed, make sure that the amount listed as the principal balance is correct. The yearly interest rate. This is the amount of interest charged by the lender. It must not exceed the maximum rate of interest as set by Rhode Island usury law. Payment agreement. This section contains information that explains how the loan will be repaid by the borrower. It should include the payment address. It should also list the full number of payments or installments that must be satisfied, the amount of each, and the due dates for the payments. If there is a late fee, the amount of the fee and when it is added on to the account should be listed in this section. For secured Rhode Island promissory notes, include a description of the collateral. Without a description of the collateral, the lender may have no legal right to collect it. Interest Due in the Event of Default. This is the interest rate that will be used if the borrower defaults on the agreement in some way. Payment Allocation. This is how the payments made are split between the principal balance and the interest. Prepayment. What happens if the borrower pays off the loan before the end of the term. This may result in the borrower having to pay a financial penalty. Acceleration. The lender’s legal right to immediately demand the borrower repay the outstanding balance because of non-compliance with the terms of the contract. Attorney Fees and Costs. How attorney fees and costs incurred by one or both parties related to the Rhode Island promissory note will be handled. Waiver of Presentments. The borrower must still make payments even if the lender isn’t physically present at that time. Severability. The remainder of the promissory note stays valid if one portion of the note is found unenforceable as a matter of law. Conflicting Terms. This clause explains how any conflicting terms in the agreement will be resolved. Notice. Whether or not the borrower will receive some sort of notification from the lender if the lender plans to sue for defaulting on the agreement. Governing Law. The name of the state whose laws will be used to handle any dispute arising from the agreement. Certain types of Rhode Island promissory notes must be notarized when they are signed by the borrower. There is a cap on the amount that a notary may charge for their services when a promissory note is involved. Both the borrower and co-signer should sign and date the promissory note.